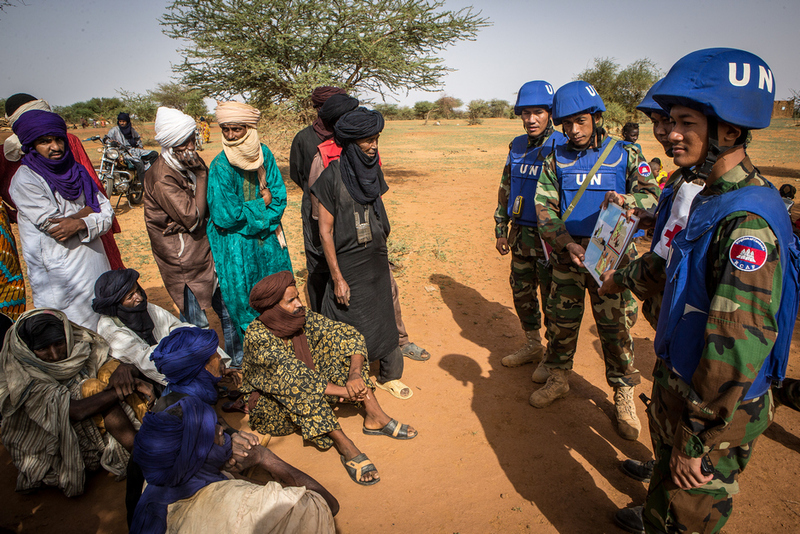 Civilian-military activities carried out by the MINUSMA Force for the benefit of the population in Mali. Peacebuilding is an arduous challenge — one that demands creative and comprehensive solutions. ‘Solutions’ that are all too often built on sand. ‘Solutions’ that are only really sustainable when built inclusively, from the ground up, with various actors. 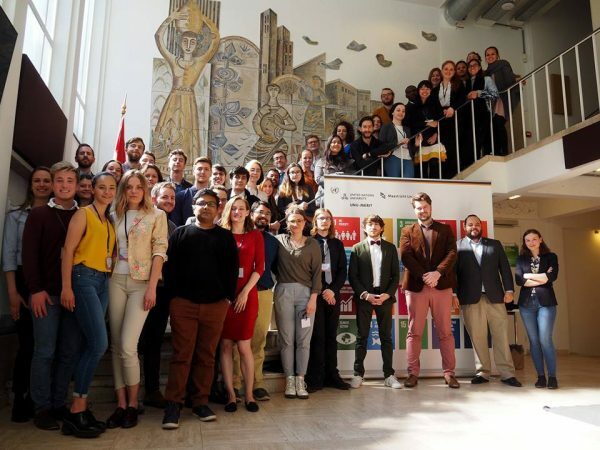 In April 2019, UNU-MERIT joined three sister institutes to lead a training event aimed at future policymakers, focusing on how best to tackle the challenges of long-term peacebuilding — all in support of SDG16 for Peace, Justice and Strong Institutions. 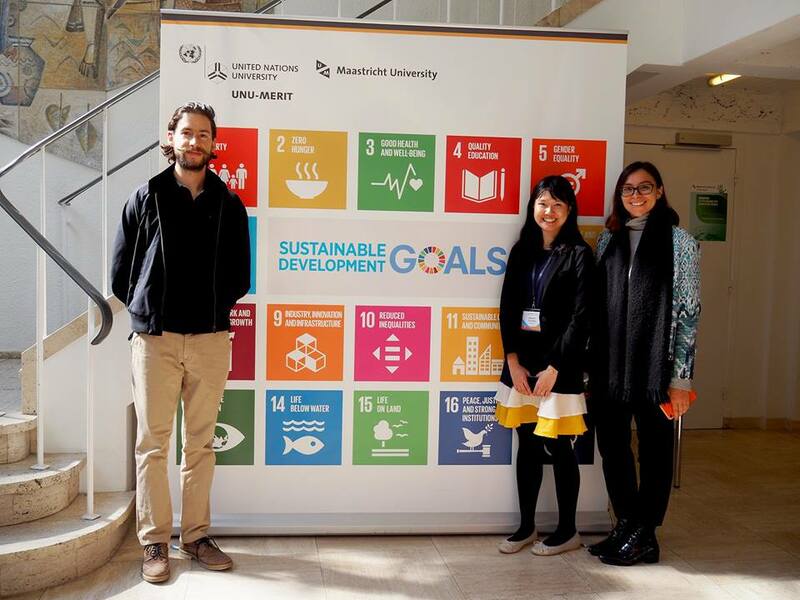 Continuing a partnership with UNU-CRIS in Belgium, UNU-EHS in Germany and UNU-IAS in Japan, UNU-MERIT co-designed and -delivered the second edition of the UNU Simulation Game. This two-day event was held in Maastricht and brought together some 50 graduate students from across our unique, global university. 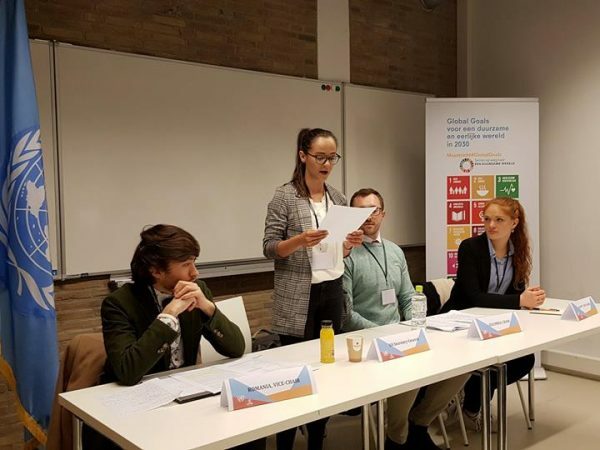 This year the students replicated the work of the United Nations Peacebuilding Commission (UNPBC) — one of the most interesting and diverse UN bodies for at least two reasons. First, as an intergovernmental advisory body, it provides advice to both the UN Security Council and the General Assembly while supporting long-term peace efforts in countries recovering from conflict. In other words, the Commission can be a bridge between these two key bodies. Second, its membership is rather diverse, as members are neither elected nor appointed by just one body or according to one criterion. The General Assembly, the Security Council and the Economic and Social Council each elect seven members. In addition, the top five providers of assessed contributions to UN budgets and the top five providers of military and civilian police to UN missions automatically gain a seat. All members serve for two renewable terms. For our simulation, a number of international organisations, UN Agencies and observer countries were added. The students worked on two agenda items: Colombia in South America and the Sahel region of Africa. 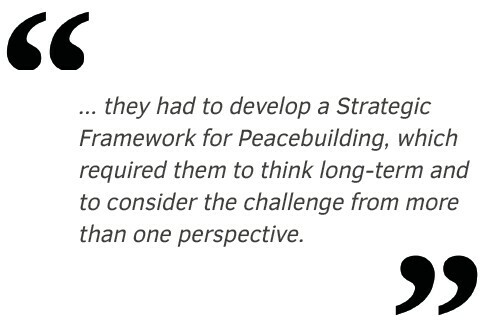 For each they had to develop a Strategic Framework for Peacebuilding, which required them to think long-term and to consider the challenge from more than one perspective. The students were divided into three thematic working groups: Good Governance, Sustainable Economic Development, and Civil Society. Each group produced one-third of the final document, which was put together by the students who represented the UN Secretariat. 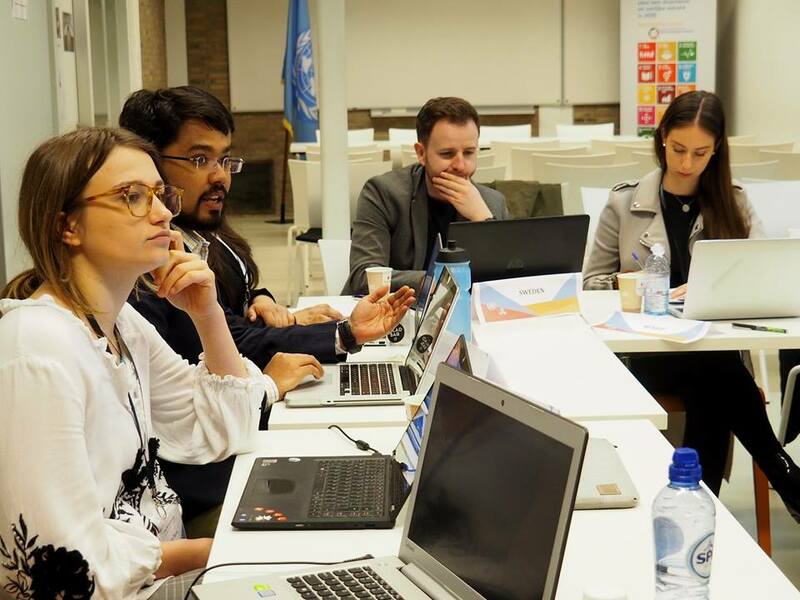 By the end of the two days, the outcomes were two very professional and well-thought out documents which, although sketched out in a short time, showed the capacity of UNU students to develop policy solutions to some of the most complex challenges in the world. Overall the competition gave students an opportunity to apply their theoretical knowledge to practical problems and improve their memo-writing, negotiation and presentation skills. 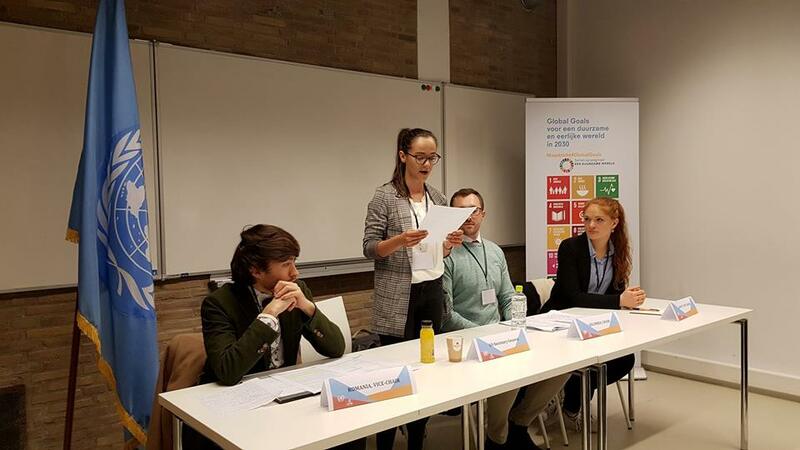 Finally, the simulation was a great opportunity for students to interact with peers from across the UNU network and to gain valuable insights into the challenges of policymaking. Open the boxes below for a selection of impressions from the students. The Simulation Game has been a great contribution to my understanding of the practicalities of drafting policy papers. The official atmosphere during the simulation game, with regards towards rules and procedures of the UN Peacebuilding Commission, assured that the participants got a learning experience which is not provided for in academic literature. The fact that all the participants stayed in their “role” during the simulation game, resulted in challenging discussions between, for example, Iran and the USA. This made everyone reflect that negotiations and multilateral meetings are not easy and do not always proceed as outlined in certain books or procedures. Moreover, these challenging discussions in combination with the (sometimes) limited scope of operation of the Peacebuilding Commission resulted in a better understanding on what difficulties the UN faces. We obtained a decent impression on how one should try, even though that is hard, to satisfy the needs and wants of every participant in the meeting. An important factor in doing so was the process of drafting the policy paper. We realised that endless discussions on what every participant would like to achieve was important, however, putting this down in writing was even more beneficial. It allowed us to get familiar with the outline and formatting of official UN documents. However, the most important, and challenging, part was to put all those different opinions down in a clear and concise paper. Formulating a precise policy paper with such a diverse number of stakeholders assured that everyone learned how to do research for the specific matters, how to write down ideas without harming an opinion of another participant and how to formulate this in a correct manner. Overall, I can say that the Simulation Game provided for insights in the drafting of an official policy paper and how to negotiate with various partners on challenging subjects. Protocols, position papers, discussions and agreements were part of the UN simulation this year. As researchers and policy-makers students, we were encouraged to identify root causes and propose mechanisms to reach stabilization and development in the conflicted areas. I found challenging the complexity of bilateral and multilateral agreements; we’ve realized that is needed an overarching and sensitive framework to encompass international efforts. Being part of the Simulation Game of 2019 has been an eye-opener for me. We only got to know the participants from the other Institutes during the simulation when we started working together. Seeing everyone taking on their role and acting it out has taught me that taking on a role of an international actor whose positions you do not agree with can teach you a great deal. Regarding the preparation and my own expectations, I started off being worried that I would make mistakes or maybe not know what to do. However, the environment was open to teaching me in the process of the Game and I did not feel under any pressure. It became even fun for me to take initiatives because of how supporting the environment was. Learning to work in a group and take on a leadership role, and communicate with everyone, and reach a consensus has taught me a lot about how the UN in real life works. Reaching an agreement or policy with Member States with conflicted views can be really challenging and it should not be underestimated. Apart from the game itself, I am thankful for the people that I met. Being in a room with students with similar interests but different perspectives was an amazing experience. This has motivated me to participate even more in other activities and go out my comfort zone. Never ones to turn down a chance for debate and policy positioning, nearly 60 graduate students of four UNU institutions, as far away as Japan, came to our surprisingly sunny city to engage in two policy areas of the current Peacebuilding Commission: the Sahel region and Colombia. It was an experience that allowed students to come together to develop cooperative skills of negotiation and policy recommendations acceptable across national interests. While national perspectives were indeed upheld through these discussions, real-life international disputes were settled amicably with ample food and coffee to diffuse tensions! Division into three separate working groups, after initial welcomes, allowed specific policy areas to be explored in depth over the two days; this provided excellent opportunities to consider realistic outcomes to affect change within the region, allowed by the scope of the UNPBC remit. Indeed, the policy from the working groups was then passed to the UN Secretary-General, Lola Dourt from UNU-MERIT, and her team for their resilience in combining and condensing our work into a document long enough to resemble actual UN resolutions! It was a beneficial entry into the world of MUN, and somewhat of a baptism of fire for me as both chair and delegate of country of discussion (Colombia), but one that is highly recommended for future students within the faculty. 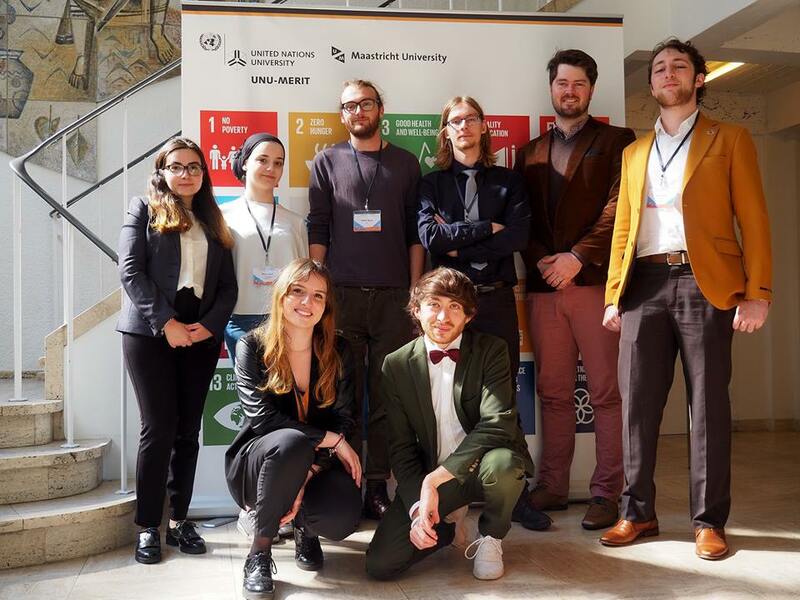 The simulation challenged us to creatively develop our theoretical skills into real life application and provided an excellent opportunity for the UNU institutions to meet. 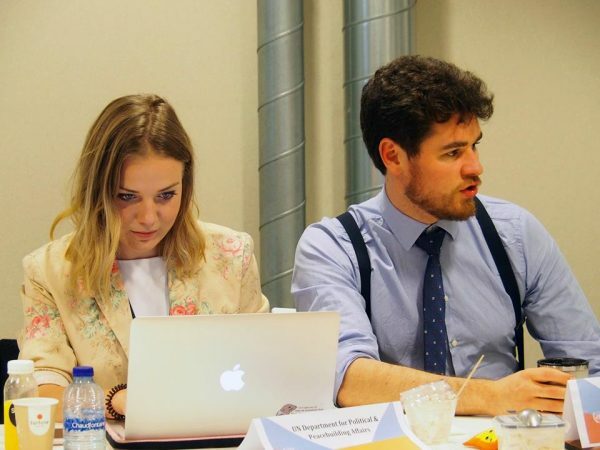 The Simulation provided an enabling atmosphere that tested the skills of policy making and diplomatic engagement needed in aspects of professional world. My participation as a student was an eye-opener and informative. I participated as delegate of Turkey in the working group of Civil Society focusing on the theme of “Gender Equality; Youth & Education; Human rights (SDG4; SDG5)”. We were tasked to produce a policy plan within a time-frame requiring focus on both policy making and adherence to rules of procedure observe at UNPBC meetings. This proved daunting at the early stages. I was on the low side and less confident particularly for the rules of procedure at the early stages as this aspect was new to me. 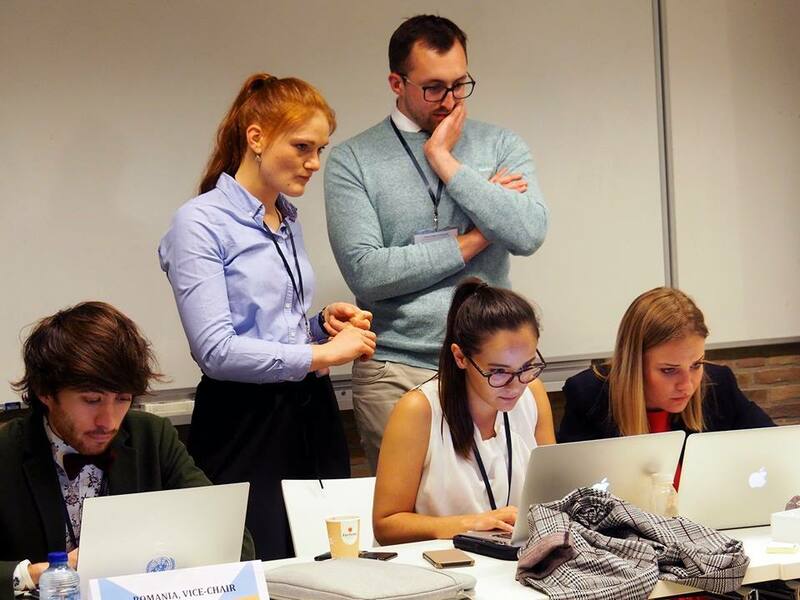 The experience of some delegates and parties (all being student representatives) in past UN model simulation was a great knowledge pool which I gained from in understanding the “rule of the day” whiles contributing as a delegate of an observer state. The first day of simulation was really insightful as we quickly got acquainted to each other. Some delegates of member states and international organisations appeared to have form some sort of alliance as to what their policy direction should be by lobbying with convincing arguments for votes to get their recommended policies pass. This informed my key take home message that technical knowledge on a subject is important but not enough to produce the needed results. The second day of the simulation exercise despite involving the same working group and theme was not just a rehearsal but reaffirm in a practical sense the notion that a “best-fit” or one-size-fits-all policy is hardly possible. Having the opportunity to participate in the UNPBC simulation as part of educational training provided beforehand an assessment tool that allows me to cross-check my scorecard as to whether this is an area I should consider for future professional life. In addition, interacting with other students under the UNU umbrella was a networking experience and a well appreciated fun. Taking part in the UNU simulation and being in such an environment with passionate and knowledgeable people from all corners of the world was truly a superb experience. Both days were very busy; not only debating but also drafting our policy recommendations took a lot of engagement from everyone involved. It surely was no easy task coming up with a consensus and a framework of action but all working groups managed to do so in time and very swimmingly. I enjoyed participating in the simulation. Representing a UN Agency allowed me to visit all three working groups that were established to cover different areas of the policy recommendation and pursue separate, but interdependent, Sustainable Development Goals. Approaching the issues at hand from various angles and with different regards for each policy area made it even more interesting. Overall I believe everyone involved had an interesting time there and were tested to deliver their best and finally practice for the policies they might one day have to write in the future.